Yesterday evening, when I strolled along the streets of the Marais, John Galliano’s car was waiting in front of his door at rue de la Perle. It’s unmistakable: the fashion shows are on. The chauffeur was waiting to bring the British designer to the next dinner party. Also unmistakable are the traffic jams in the narrow streets of the Marais. They are often triggered by huge trucks trying to make a u-turn after having delivered their materials for the shows, which are held in the most odd and extravagant places such as indoor carparks, museums or empty hôtel particuliers. How often did the media tell us that haute couture was dead? Since when? It seems like forever. And now, since we are in the throes of a huge economic crisis, the fashion world is even more exited about all this outrageous abundance of luxury. Fact is, that despite the credit crunch followed by a global recession, sales of couture are up. Not down. Take Valentino. 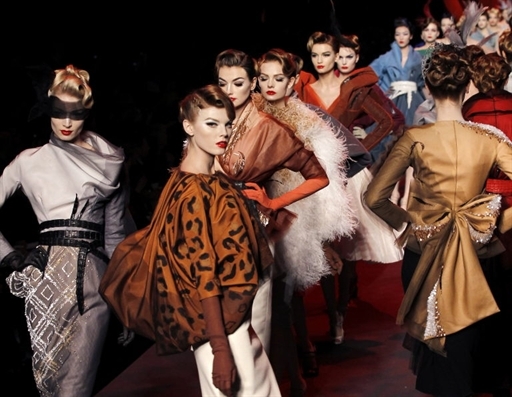 Stefano Sassi, CEO, declared in Paris that he is aiming to grow their couture business by 20% this year. But where are the clients who can afford an haute couture dress at the price of a family car? Leila Trabelsi, the wife of Tunisian ex-president Ben Ali, might have tons and tons of gold but she’s kind of out of the game. At least she'd better not show up in Paris at the moment. Even if she will probably buy in private now, she might lack occasions to wear haute couture in the future. Crises, revolutions, haute couture doesn’t care. They are selling dreams without worrying for one second who will actually be able to wear or to buy their masterpieces. Nobody demonstrated this more elegantly than John Galliano. The Dior show was officially inspired be René Gruau, the fashion illustrator at Dior back in the 1950s. Have a look on the photo taken at the show in the Musée Rodin on Monday: a gorgeous quote of elegant times. Galliano just claimed “effortless grace”. The truth is, that Galliano followed the mad-mend-madness. It was “romantic, dramatic and noble” as Suzy Menkes put it, “strictly haughty, never naughty”. Let’s translate this and make things a bit clearer: transgression is over because the decades when growth was taken for granted are over. We have to work hard again. But we are also aiming high again. Insecurity makes us move. And all of a sudden the spell of haute couture is back again.